What products can be certified noxious weed free? Where can I buy certified noxious weed free products? How will I know if I am purchasing certified noxious weed free products? How can I arrange to have my field inspected? Why are there two standards for field certification? What weeds are listed for each standard? What can I expect when my field is inspected? What is the fee for certifying a field? What is the cost of bale tags? What is the cost of North American Standard twine? Can the Idaho Crop Improvement Association certify my field as noxious weed free? What is guaranteed by NWFF&S Certification? What is NOT guaranteed by NWFF&S Certification? How does a person become a certifying inspector? Whom should I contact if I see a noxious or unknown weed? Why should I be concerned about the spread of noxious weed seeds through non-certified forage/straw products? 1. WHAT PRODUCTS CAN BE CERTIFIED NOXIOUS WEED FREE? Alfalfa hay, grass hay, grain hay, forage (hay) cubes, pellets, compressed forage bales (twice compressed, eliminating 65% of the volume), other kinds of hay, and straw. State Certified Noxious Weed Free products typically garner a higher price than equivalent-quality non-certified products. USFS and BLM requirements can vary from state to state, contact the public land manger in the state you wish to visit. 2. WHERE CAN I BUY CERTIFIED NOXIOUS WEED FREE PRODUCTS? A list of certified Forage and Straw Growers can be found at the following web page: Weed Free Forage and Straw. This list is not totally inclusive and other vendors may have certified product. Other options include contacting the County Weed Control Superintendents in your county, newspaper classified-ads, or locating a retail animal feed store in your area that sell certified Noxious Weed Free Forage products. Certified forage cubes, pellets, and compressed forage bales should be available at most retail animal feed stores. 3. HOW WILL I KNOW IF I AM PURCHASING CERTIFIED NOXIOUS WEED FREE PRODUCTS? You will know you are buying certified Noxious Weed-Free hay/straw bales by the ISDA certification bale tag (made of vinyl), which has the calendar year printed on it and is attached to the bale twine, or it will have at least one strand of purple and yellow (intertwined) twine. 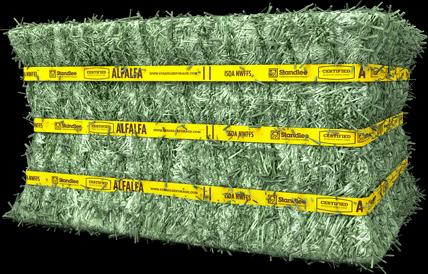 Certified Noxious Weed Free Compressed Forage bales (twice compressed, eliminating 65% of the volume) can be identified by the yellow binding (strapping) material with the statement “ISDA NWFFS and the manufacturer’s name” printed in purple. In addition, two consecutive vertical purple lines are placed before and after the above statement. 4. HOW CAN I ARRANGE TO HAVE MY FIELD INSPECTED? To request a field inspection or fee information, contact your County Weed Control Superintendent. Please contact several weeks prior to the intended harvest date. Bales must be marked with either a ISDA certification bale tag or North American Standard (purple and yellow) certification (intertwined) twine (minimum of 1 strand per bale). North American Standard twine can only be used on bales that are certified to the North American Standard. NWFFS certification bale tags and North American Standard purple and yellow twine is only available from the Certifying Inspector. A Transit Certificate will be issued, upon request, for interstate shipments of certified forage or straw that is comprised of bales that are not marked with bale tags. (If bale tags are affixed, a transit certificate is optional. 5. Why are there two standards for field certification? There are 18 noxious weeds listed on the North American Standard that are not listed on the Idaho Standard. Two of the weeds on the North American Standard weed list are Quackgrass and Wild Oats. These weeds and some others are well established in many regions of Idaho. If Idaho only had one standard, the North American Standard, it would be very difficult to certify fields where those weeds are present. ISDA feels that having two standards allows a greater abundance of certified forage and straw throughout the state and still meets the Idaho USFS and BLM Noxious Weed Free Hay Order requirements. Approximately 90% of the forage and straw inspected in Idaho is certified to the North American Standard. If you are planning a trip to USFS and BLM lands in another state, it would be prudent to possess only North American Standard certified products. The advantage of North American Standard certified products is that they can be shipped interstate to neighboring NAISMA states that only recognize the North American Standard. Idaho Standard certified hay and straw meet the Idaho USFS and BLM Weed Free Hay Order requirements, however, may not be accepted by neighboring states Hay Orders. 6. What noxious weeds are listed for each standard? Comparison List between the Idaho Standard and the North American Standard. 7. What can I expect when my field is inspected? An ISDA trained Inspector; typically a County Weed Superintendents and/or their employee will inspect the perimeter of the field and the interior of the field for the presence of North American and Idaho State Noxious Weeds , using various patterns depending on the field shape and size. The Inspector will provide a copy of the inspection to the grower. 8. What is the fee for certifying a field? A minimum of thirty dollars ($30) per inspection shall be charged for up to ten (10) acres and three dollars ($3) per acre thereafter, for fields up to ninety-nine (99) acres. Fields that are one-hundred (100) acres or larger in size, the fee is three dollars ($3) per acre for the first one-hundred (100) acres and two dollars ($2) per acre thereafter. 9. What is the cost for ISDA certification bale tags? 5 cents per bale tag. 10. What is the cost of north american standard color-coded twine? About 20 percent more than regular twine. North American Standard purple and yellow twine is manufactured in limited quantities compared to regular twine and is only available through ISDA and County Weed Control Superintendents. 11. Can the idaho crop improvement association (ICIA) certify my field as noxious weed free? No, the ICIA formerly inspected fields that were being grown for certified seed (ie. barley, wheat, grass seed crops), however, the ICIA no longer conducts these inspections in conjunction with the ISDA NWFFS Program. 12. What is guaranteed by NWFF&S certification? It provides assurance that the field was inspected based upon a reasonable and prudent visual inspection, and no noxious weeds were detected. It permits entry of the certified products (Idaho Standard) into USFS lands in Idaho, and into (North American Standard) USFS land throughout the U.S. and in Provinces in Canada. In other states, some jurisdictions have custom rules that need to be observed. An example would be a county with a county wide requirement that any forage or straw imported must be certified North American Standard noxious weed free. As a reminder, always contact the State Department of Agriculture, USFS, and BLM for the state where you plan to travel. 13. what is not guaranteed by nwff&s certification? It does not guarantee a complete absence of noxious weeds. It only certifies that the inspector made a reasonable and prudent visual inspection and did not find any. It does not certify quality, protein content, maturity, etc. It does not mean that there are no non-noxious weeds in the product. The inspector may note on the inspection certificate other factors, such as other weeds, but certification is only for noxious weeds. Certification under these rules does not qualify a commodity for export from the United States. Applications for certification for export should be made directly to the Division of Plant Industries within the ISDA. 14. how does a person become an nwff&s inspector? Contact Dan Safford at ISDA (208) 332-8592 or email at dan.safford@isda.idaho.gov. To become a certified inspector you must attend an annual ISDA approved training course. The County Weed Superintendent is in charge of Inspections in their county. 15. whom should i contact if i see a noxious or unknown weed? Contact your County Weed Control Superintendent, or the public land manager where you are recreating. 16. why should i be concerned about the spread of noxious weed seeds through non-certified forage/straw products? Noxious weeds displace native plants species, diminish the beauty of the landscape and recreation experience, decrease wildlife habitat and ecosystem bio-diversity, and increase soil erosion rates, sending sediment into streams. Once a noxious weed species is widely distributed it is very difficult to remove it, making their effect on the environment permanent. For more information about Noxious Weeds please visit our Invasive Species - Plants page. Photo Credit: Dan Safford, ISDA.